When you’re out in uncharted territory, you can’t rely on street lights to illuminate your path. In the battle against the darkness, your rig needs more than your headlights. You need a light bar! Truck light bars can be mounted on both the top of your vehicle and the windshield. Light bars add style to your vehicle and are simple to install. Light bars and truck lighting accessories have come a long way from throwing a few lights on the front of your truck. Todays light bars are both stylish and function and fit most trucks. 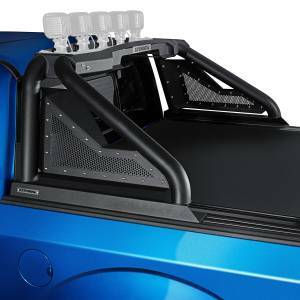 Carr Deluxe Light Bars and Carr Low Profile Light Bars are some of the most popular light bars on the market. BumperSuperStore.com also carries the leading manufacturers of light bars including N Fab, Smittybilt, Go Rhino and Carr. If you're looking to add function and style to your truck then get yourself a light bar.